FIVE consecutive home games for the Anchors scheduled in the next few weeks…… including an eye-catching Durham Cup tie against top 4 National League North side Spennymoor Town on Wednesday October 24th and coming up on November 3rd our long awaited reunion with the Buildbase FA Vase in the form of a 2nd Round tie against Ashington FC. 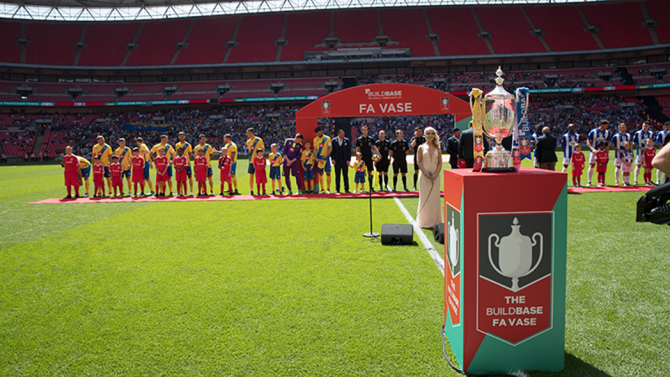 This competition will forever hold a place in the hearts of everyone connected with the club and the memories of the fantastic journey to Wembley we enjoyed last season are still strong. Sponsorship packages are available for all of these games…. Why not get involved and for a reasonable cost, you would receive some great publicity for your business via our social media outlets and at the same time have an enjoyable entertaining day out for your business colleagues or family at the Coverall Stadium. Match Day Sponsor is £175(+Vat) and includes a full page programme advert, social media mentions and entry/hospitality for 4 people, also with a signed match ball. NB Mascot duties are also available via this package (any First Team kit required would be charged at cost). Full details of the packages can be found here…. Other competitively priced packages available include Player Sponsorships and Pitchside Boards. View our brochure online call 01642 604 915, or email info@stocktontownfc.com with your details and we will contact you to discuss your requirements.